My daughter is my little adventurer. She is the one who wants to learn to ride the four-wheeler first. She is the one who wants to climb the tree, to creep to the top of the mountain, to let her legs dangle and swing her way across the monkey bars. Recently we were at a climbing gym and, with her long legs, she scaled the side of the boulder. But she couldn’t quite get to the top. She couldn’t quite bring herself to reach up into the unseen and find a grip, pull herself up. She came back down and the disappointment hovered around her eyes. “Next time, Kid,” I said, wrapping her in a hug. Ever since I decided to give up social media and spend some time “diminishing,” I have questioned the decision. Why? What am I trying to get out of this? What’s the point? I’m not an ascetic for ascetic’s sake. I don’t want this to become a practice of denying myself simply for the sake of denial – I find that, at least in myself, that sort of thing tends to lead less to awareness and contemplation than it does to a subtle pride. Look at me. Look at how spiritual I can be. That’s not what I’m after. So why? Why step out of the small limelight I had created? Why stop promoting my writing? Why take a path that would lead, if followed to its logical end, to complete obscurity? These are the questions I keep asking myself. I’ve been listening to an Henri Nouwen sermon I found online, one in which he speaks about how each of us is the Beloved (the first part of the sermon is at the bottom of this post). In the sermon he talks about how we try to answer the question, “Who am I?” by analyzing different things in our lives: What do I do? What do people say about me? What do I own? And as I accomplish wonderful things, as people say nice things about me, and as I purchase things that make me happy, I feel good. I feel like a productive individual. I feel like I am worth something. But then I fail at something. People say bad things about me. My finances drop and I do not own the things that make me feel good. Suddenly I feel worthless. This is a never-ending cycle, Nouwen explains, a treadmill from which we must escape because there is no end to it, no end to the striving and the deep-sea crashes. But how? How do we stop defining ourselves by what we do, what people say about us, or what we own? There is only one way, and that is to understand that I am God’s Beloved. No matter what I do, no matter who I influence, no matter what I have, that remains true. 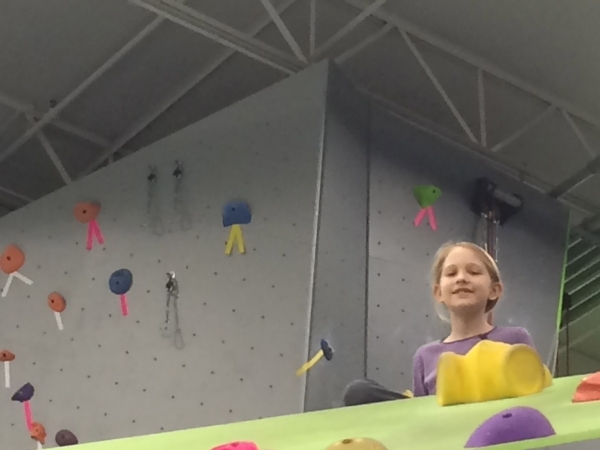 My daughter climbed up to the top of the climbing boulder and sat there. She had finally made it to the top. I could see her head just above the ridge, and she was smiling. I don’t love her because she made it to the top of the boulder. I don’t love her because the adult next to me looked at me and smiled, thinking good thoughts about her. I don’t love her because of any earthly thing she owns. I love her, I adore her, because of who she is. She is my daughter, created in my image, and there is nothing she could do to lose that love. Could I love better than God loves? Could I somehow be more kind or caring towards my daughter than God is towards me? Could I love my daughter with no strings attached while God can only love based on merit or behavior? No. The simple answer to that is a resounding no. And this is the lesson I am learning while I let myself diminish, while I watch my blog numbers plummet due to lack of promotion, while I miss out on connecting with agents or publishers because I’m not on Twitter or Facebook. Layers of me are being stripped away, and I am left with the simple knowledge that I am the Beloved, and that is enough. Shawn, it’s an awesome thought to grasp that He loved us enough to invade earth in human form to die so we can be with Him forever and there’s not one thing we ever did or can do to deserve it. we carry but do not truly need. I have found some people never returned because they could not get why I didn’t need to go the spa or have exotic vacations. My life is simple and true and pure and real. It will be exciting to watch you unfold, shed and grow throughout the year. I will never go back to the old me. no matter how many people regale me with their adventure stories and purchases etc. Thanks Shawn, for the video of Henri Nouwen. It explains the concept of being God’s “beloved” so well. And it’s such wonderful knowledge. All this reminds me that the only things that are true are paradoxes: power made perfect in weakness, death to attain eternal life, happiness through self forgetting, communal strength based on shared weakness (Nouwen today) and so forth. God’s reasoning (as well as his love) so far surpasses our own. Yes, Barbara, and as Richard Rohr would say, these are all things that cannot be comprehended by a duality mindset. We have to remain open to contemplation and non-duality thinking. Thank you Shawn! My husband and I prayed specifically this morning for God to bring us words of encouragement. Worthless feelings certainly can sneak up suddenly, leaving us empty. All Christ followers must grapple with asking what is the point? It seems that only In that empty place we are able to look up and remember our Father. Keep using your gift to point us back to Him. Thanks for your comment, Bronwyn. Stay encouraged.